human rights « kashmir blogs-Truth about Kashmir-" kashmir blog""
I and my friends Manish and Sunil were going to Garh-Mukhteshwar for a dip into the holy Ganges. As soon as we reached Garh-Mukhteshwar, we took a boat to go to other side of the river for a swim. The rays of the sun were shimmering in the waters of Ganga , intermittently blinding our eyes. The garland of flowers floating nearby shielded our eyes briefly, thus giving us some respite. That Garland may had embellished an idol of god or it may had been a final gesture of reverence to the dead by a family member. Who knows! Anyway, We reached the other side within minutes. A Panditji was offering prayers for his clients, who were repeating the hymns chanted by the Pandit. I have always believed that the cool waters of the Ganges rejuvenates my body and mind and Manish could not disagree with me .After the Bath/Swim, we sat on the wooden planks nearby. And Manish started about his favorite topic-Kashmir and Kashmiri Pandits. 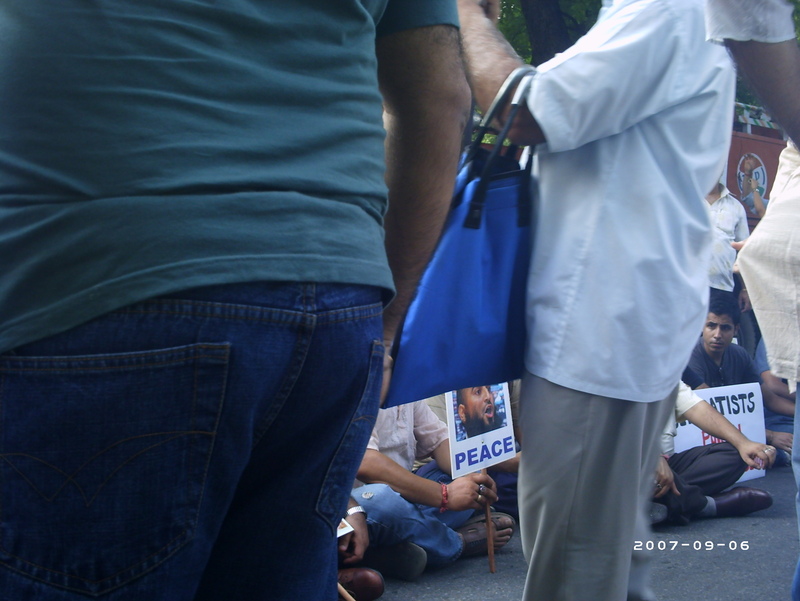 An elderly Gentleman, who was sitting opposite,just a couple of meters away, on the other wooden plank approached us and asked, ”Are you Kashmiri Pandits?” I said, ”yes we are”. He said,” My name is Singh, I have served armed forces and I was Stationed at Kashmir in the nineties”. Manish-what is your present assessment of Kashmir? Singh-It is better than nineties ,but it is still not Normal. When I was there, it was like a guerilla war, we never knew when, where , how and who will attack us. We had to be prepared at all times. Had we been given powers, we would have normalized the situation within a day. It is the politicians, who are doing the macabre dance on the cost of the lives of their soldiers, just to enhance their political career. Manish- You must have heard the cacophony of pro-jihadi , anti-India, and anti-Hindu slogans, that was voiced from the loudspeakers of the Mosques across the valley? Singh-Yes, I did and so did my colleagues. Manish-Did you met Kashmiri Pandits there? Singh-Only in the early 1990.You fled to jammu and other parts of India as the terrorists were killing you. Manish-It was all pre-planned. The majority of the Muslims, in the valley, were privy of the plans and intentions of the Terrorists. But they maintained a sinister silence. Sunil-In 1947, the army of the Maharaja sided with Pakistan and thus helped Pakistani army to annex POK. This all happened on the name of religion. The same happened at the time of Sukh Jiwan Mal, when his army deserted him. Yaqub shah, being a shia muslim was also deserted by his army. History repeated itself in 1989-90 and Kashmiri Pandits were rendered homeless. Singh- The lack of political will is a deterrent for the return of Kashmiri Pandits. you are not a vote-bank and you did not even raise your armed unit to counter your hostile contemporaries in Kashmir .The political will is a must for the return of Kashmiri Hindus. Kashmiri muslims are being heard because they talk not only diplomatically masquerading peace, but when the need arises ,they restore to violent methods also. They know how to be heard. Manish-We are a peaceful community. But that does not mean that we are naïve. At the same time, I have to agree with you. Our peaceful nature has become a hindrance. The govt. too knows this fact, that is why they have not been able to make inroads for the kashmiri pundits into Kashmir. Pakistan has a Plan for Kashmir and Kashmiri Muslims. National conference, PDP and congress has plan for Kashmiri Muslims .The plan for Kashmiri Hindus is to appease Kashmiri Muslims by marginalizing KP’s socially, financially, religiously and politically . As you said it is vote-bank politics. Sunil-The valley-centric political parties are playing dirty politics. They have over years, successfully sown the seeds of hatred against India. 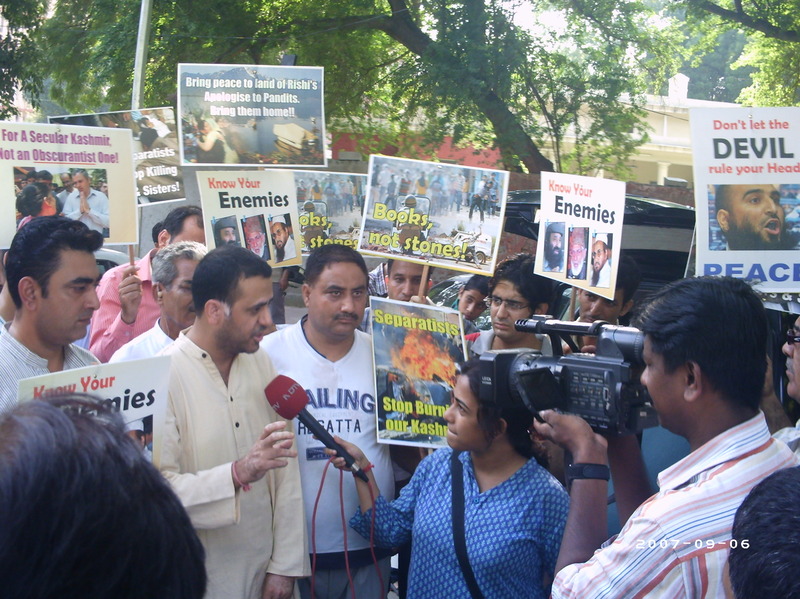 The frequent outbursts of Mustafa Kamal against India is not new. The recent obnoxious statements of NC MP Ghulam Nabi Ratanpuri is also not new. Attaullah suhurwardy,a senior NC Leader, the former minister and Deputy speaker had said in a speech in State legislative council that he is first a Muslim then an India and that It is the fundamental duty of a Muslim to strive for conversion ,any muslim who forgets this duty is not a worthy Muslim. The Kashmiri Hindus were proving to be an impediment for the religious zealots and bigoted politicians. PDP is also no saint. 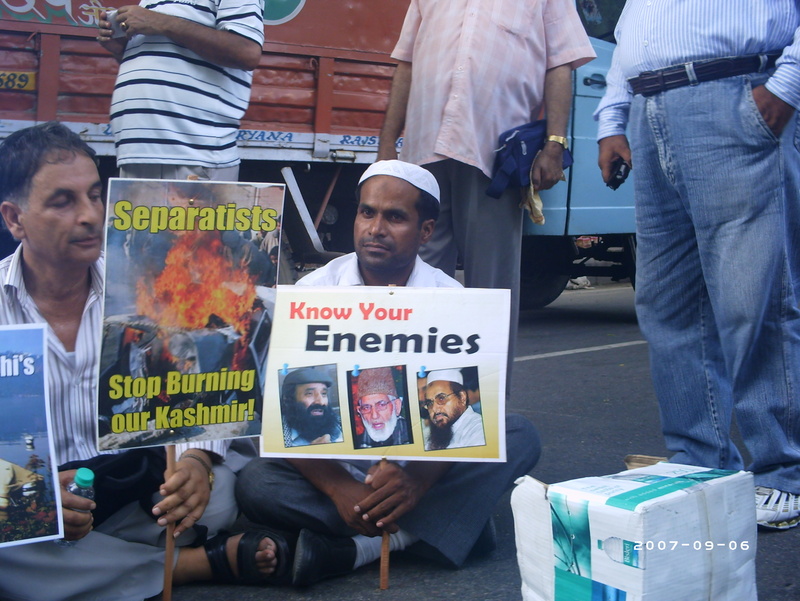 Their patron Mufti mohammed syed instigated riots and violence at Anantnag, which led to migration of many Kashmiri pundits in the mid 1980’s.It is a known fact that when he was the chief Minister of the state, he did not used to salute the National Flag of India on special occasions like 26th jan or 15th August. It was a clear indication to his vote-bank that he does not care about India. These gestures by the valley-based mainstream political over the years have poisoned the minds of majority of Muslim minds. This propaganda has lead a Kashmir Pandit to a point of no-return. Manish-That is why we demand a separate homeland for Kashmiri Pandits. we have seen seven migrations. Enough is enough .We can not live anymore at the will and whim of Islamist fundamental jehadi mindset politicians, who use us whenever it suits them and discards us when it suits the emotions of their vote-bank. Singh-The politicians should consider this option. As I said a political will of the government is a must to facilitate the return of Kashmiri Pandits. Manish –If Govt. is not serious to facilitate our return on our conditions then, let them formally announce us as Refugees. There are many countries who have special laws for refugees. We will also find one such country. At least we-the kashmiri Pandits can live as a community and preserve our ancient heritage and culture. Singh-Govt. should ponder over this point too. You see, Kashmir matters for me as well! Sunil-How does it really matter to You or rest of Indians .Majority of Indians are still oblivious to the plight of Kashmiri Pandits. Majority of them still believe that we live in Kashmir even today. Singh-You may be right! But I too have given my blood for Kashmir. I was hit by the bullet in my right leg. My colleague was killed in the Gun battle with the terrorists, in front of my eyes. I too faced trauma-physically , emotionally as well as mentally. He folded up his trousers to the thigh. There was a livid Scar above the right side of his right knee. I looked at the face of Singh. It was livid as well. The sweat drops on his forehead made me realize the conspicuousness of his Curled white moustaches that still had some shades of black. Just like his personality. Calmness descended on his face as he curled down his trousers.. He was again composed .Manish was looking at him intensely. 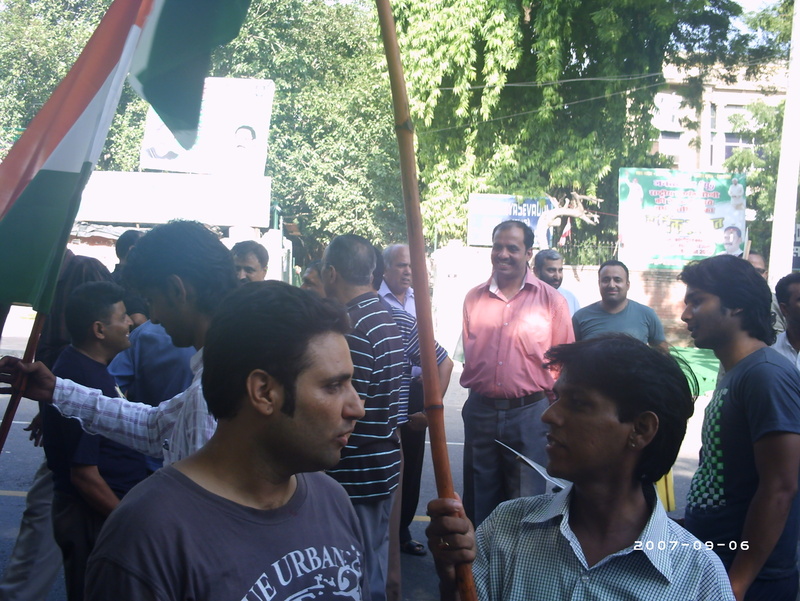 Manish-Singh Saab, I appreciate your patriotism. You are also one of our many unsung heroes, who gave their blood for Kashmir. Sunil-I agree with Manish. Where will you go from here singhji? Singh-I live in Gajraula. I will reach there within half an hour .Where are you going? Manish-Lucky you. You have a place to be called as Home. My home is illegally occupied by some Muslim men in Kashmir. By the way, we are going to NOIDA. Singh fared good bye to us. We watched his back as he walked with a limp towards the Boat. His family was already in the Boat. A man grabbed his hand and pulled him into the Boat. The boatman paddled the Boat away from us. we waved with our hands at Singh. He waved back. He alighted from the Boat, ascended the stairs , looked back at us and again waved. we waved back. 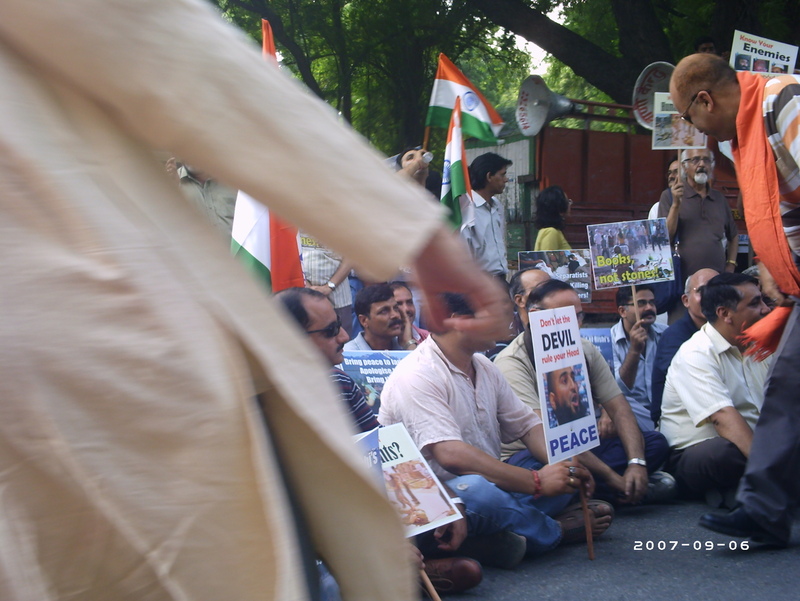 Singh Saab was gone but there are thousands of singh saab’s who have fought for Kashmir. Kashmiri Pandit’s fight for the restoration of their rights and justice is long, arduous with little support from the Government machinery. For some, it may look impossible to restore our basic fundamental rights in Kashmir. At times, it feels that a Kashmiri pandit is fighting a lone battle. But then we meet some people like singh, for whom Kashmir still matters. And hope floats. Just like that garland that floated in the Ganges and shielded our eyes from the blinding reflections of the Sun….. 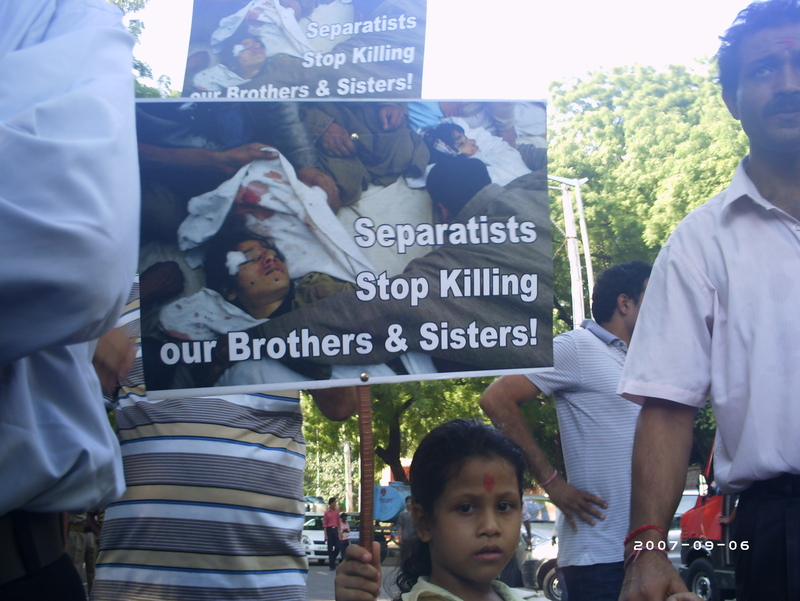 Petition to UN Secretary General..
(AFSPA) from militant and terrorist infested areas. The UN betrayed Kashmiris by not recognizing the accession of J&K State to the Republic of India legally and constitutionally executed by Maharaja Hari Singh, the ruler of the state, on Oct. 26, 1947. The accession enjoyed over whelming support of the people and their leader Sheikh Abdullah. The instrument of accession was executed in accordance with the provisions and processes of the Independence of India Act duly adopted by the British Parliament. 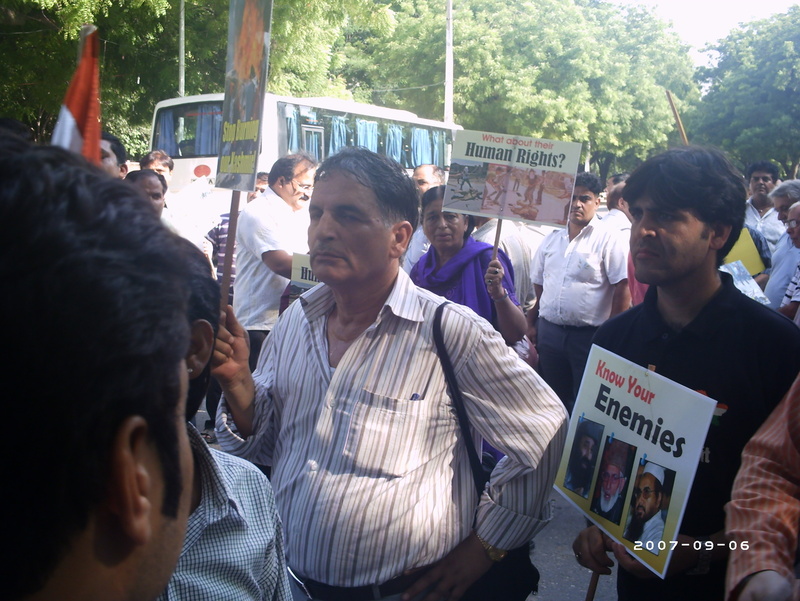 The UN betrayed Kashmiris when in 1998/99, Mr. Feodar Starcevic, Director UN Information Center stationed at New Delhi, India, declined to take action on an appeal by a delegation of the victims of terrorism and Islamic Jihad for UN Secretary General’s intervention and for recognizing them as IDPs on the pretext that such action would amount to meddling into the internal affairs of India. But now like a hypocrite Mr. Christof Heyns, the special UN Rapporteur, in asking India to repeal its security law did exactly the same. The UN betrayed Kashmiris when it completely disregarded and violated the emphatic declaration of Mr. Kofi Annan, the former UN Secretary General, to the effect that UN resolutions on Kashmir had lost their force and that the issue of plebiscite was redundant. Clearly a junior official of the UN seriously violated and contradicted the public statement of the Ex-Secretary General yet he was neither disciplined nor was he corrected. The UN betrayed Kashmiris by tricking India in to accepting its nuclear disciplinary regime thus prohibiting New Delhi from producing and or deploying nuclear weapons for its defense. On the other hand China and Pakistan both possess nuclear weapons and are free from the nuclear disciplinary regime of the UN. Therefore, they can move their weapons freely on the newly built Old Silk Road and Karakoram Highway from Tibet to Baluchistan, very close to the boundaries of J&K State . The presence and close proximity of these deadly weapons to Kashmir and India ’s volatile region seriously jeopardizes the security of the rest of J&K state and India . Clearly the world body has acted absolutely irresponsibly by allowing the Sino-Pak partners to militarize and nuclearise this region. The UN betrayed Kashmiris by ignoring these extremely important factors and asking India to repeal AFSPA without realizing its consequences in the region. The Islamists, separatists, Pak-agents and militants who welcomed and celebrated the UN announcement are already enjoying freedom to function without any restrictions as long as they remain peaceful and non-violent. Accepting the UN demand would mean allowing them to convert the Kashmir Valley into yet another Islamabad, Kabul and Kandahar. That should not be unacceptable to freedom loving and anti-terrorist people any where in the world. The above stated instances establish that the UN has done nothing to render any type of support, assistance or action which could provide any kind of aid, relief or support to the peace loving Kashmiri and victims of Islamic Jihad. And in its initiative under discussion the UN has also disregarded and trampled upon its own aims and objectives and provided support and legitimacy to the very people who have set Kashmir on fire and who are committed to building an Islamic world order in a “world Caliphate”. We demand that the UN should be supporting the victims of Jihad, militancy, terrorism and those who genuinely aspire for a durable peace and tranquility in the region. If the goal of the UN is to crush and defeat terrorism then despite the short sighted ideas of its keepers and the temptation of petro-dollars the world body’s present policy must be turned upside down. One of the major steps forward in defeating terrorism in Kashmir would be to resettle the victims of Islamic Jihad back in their traditional habitat, in a territory carved out for their homeland under their own authority and away from militant Wahabi fundamentalism which has been the root cause of communal upheaval and genocide. The creation of such a territory among other things will most certainly serve as a front line fortress for combating Islamic Jihad and terrorism. For the realization of this noble goal the United Nations should stand by the patriotic Kashmiris who are determined to defeat and bury Wahabbism and its Jihadi arms. 19 January 2012 will complete 22 years in exile for Kashmiri Pandits(KP).This minority community of Kashmir were forced to leave their hearth and Homes 22 years back as there was total anarchy and oglocracy in Kashmir. some rabid , religious fundamental zealots were on rampage and Target shooting of KP’s had become their Hobby.In this whole chaos KP homes were plundered and some pyromaniacs set many KP houses on fire. All this happened on the name of Jihad. At least 4 lakh KP’s left their homeland in the chilling nights of jan 1990 to safeguard their lives, honor and dignity. Today this beleaguered community is scattered all over world-Thanks to Govt. Apathy-with majority of Kp’s dwelling in India particularly Jammu and Delhi Region. Even after 22 years GOI has no blue print to bring back KP’s to their Homeland-Kashmir. GOI has negated the fact that KP’s are refugees in their own country, they better call KP’s Internally Displaced. Technically or terminologically they may be right but this terminology is more of a Hogwash, a misnomer as “Internally displaced” tag of KP’s misleads one to think that Govt. is going to reverse the migration of KP’s from Kashmir. Till today-even after 22 years nothing has happened. Post 1990,The successive governments led by either National conference or PDP, came to power in J&K with the support of congress(i), have been pre-occupied with other things and most of their activities are executed with one thing in mind-to increase the vote bank-Unfortunately KP’s do not form any sizeable vote bank and thus the Rights of KP’s have been depredated from time to time, especially since Jan 1990. Jammu region has a majority of Hindu population and overall in J&K, Hindus constitute around 30% of the total population. Being a Muslim majority state most of the policies are majority centric. Hindus of J& K have felt disadvantageous at many times, particularly in Govt. employments, they also don’t get the subsidies which their counterparts enjoy in Kashmir. Till today there has not been a single Hindu who has made it to become the chief Minister of J&K. Religion and Culture are the bipods of healthy community, Jammu being a Hindu majority Region has given ample scope to everyone to practice their religion and Culture unlike Kashmir where KP’s faced the brunt of religious apartheid. Today, K.P’s stand at crossroads, their homeland is so near still so far, their culture and religion is at the brink of extinction, their identity is being erased slowly by the polity of that Nation for which they were killed, raped, hounded and exiled. The need of the Hour is to preserve the unique culture and identity of KP’s, the unique identity that was soul of Kashmir, all that can happen only when KP’s come back to Kashmir-Their motherland . The million dollar question arises,” can they come back to Kashmir and live as they used to?” the answer is a big “NO”. Most of the houses belonging to KP’s have been either sold out in distress, or they have been burnt down or they have been illegally captured by nefarious elements backed either by Govt. Machinery or Pakistan backed terrorists. The fact is they have nowhere to go if they come back to Kashmir. Government knows this important point, they have in fact built some ghettos for KP’s where some Kp’s are residing, particularly those who were given jobs in Kashmir, Some of these KP’s have alleged that 4-5 people share a common room in these Ghettos and many basic facilities are missing in these government flats. These temporary ghettos are not a answer for reverse migration of KP’s. This way religious freedom and cultural identity of KP’s cannot be preserved. Anyways Ghettos give a feeling of being a alien. The other viable solution is a separate homeland which is most popularly known as “Panun Kashmir”. This Homeland can preserve the religion, culture and identity of KP’s for generations. Panun Kashmir is a Homeland demand of KP’s that will enjoy a union territory status like Chandigarh and all those will be welcomed here who believe in India and Indian constitution. For some reasons the present Govt. is opposing this demand also. Some of the govt. agencies have twisted the concept of Homeland of KP’s as sacrilegious and projected this demand akin to accession of Kashmir with Pakistan. In either ways the Govt’s apathy is driving KP’s to oblivion. Govt at State or at center should make it a point that KP’s are brought back to Kashmir.22 years has passed and nothing concrete has been done to preserve the identity of Kashmiri Pandits. These 22 years have made me believe slowly but steadily that in future also Govt. will not do anything except wait and watch. Tibetans have been given infrastructure, environment and everything else by the Indian Govt. just to protect their identity whereas KP’s have been deprived everything that can preserve their religion and culture. I have come to this conclusion that Govt. should now do one last favor to KP’s- Declare KP’s as Refugees and let KP’s reach out to other countries who have laws to protect the religious freedom and culture. At least that way cohesiveness of KP’s will prevail and their culture and religion will be saved. I will be more than happy if my conclusion will be proven wrong by Govt’s deeds in coming 365 days. 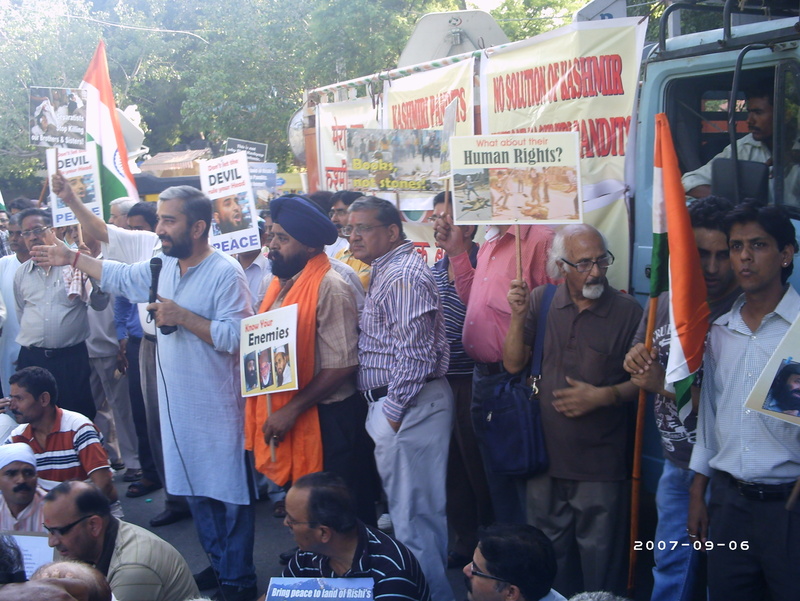 Muslims as well as Sikhs stood with their Kashmiri Hindu Brothers at Jantar Mantar,Delhi on Sundat(8-8-10).These Muslim brothers strongly condemned the killing of innocent lives in Kashmir and held Pakistan and separatist Hurriyat responsible for the Mayhem in Kashmir…. Below are some lines which depict the general sentiments of KP community in exile for 20 years…. you can see my strife..
my truth is just a waste..
my truth has been locked..
my choked truth is Gasping for air,but my India doesn’t care.. I am not Khan. My name bears a different set of four letters: K A U L. Kaul. As those who know Indian names would understand I happened to be born in a family which was called Hindu by others. Hence, we were sure, we would never get a friend like KJ to make a movie on our humiliations, and the contemptuous and forced exile from our homeland. It’s not fashionable. It’s fashionable to get a Khan as a friend and portray his agony and pains and sufferings when he is asked by a US private to take off his shoes and show his socks. Natural and quite justifiable that Khan must feel insulted and enraged. Enough Masala to make a movie. But unfortunately I am a Kaul. I am not a Khan. Hence when my sisters and mothers were raped and killed, when six-year-old Seema was witness to the brutal slaughtering of her brother, mother and father with a butcher’s knife by a Khan, nobody ever came to make a movie on my agony, pain and anguish, and tears. No KJ would make a movie on Kashmiri Hindus. Because we are not Khans. We are Kauls. When we look at our own selves as Kauls, we also see a macabre dance of leaders who people Parliament. Some of them were really concerned about us. They got the bungalows and acres of greenery and had their portraits were worshipped by the gullible devotees of patriotism. They made reservations in schools and colleges for us. In many many other states. But never did they try that we go back to our homes. They have other priorities and ‘love your jihadi neighborhood’ programmes. They get flabbier and flabbier with the passing of each year, sit on sacks of sermons; issue instructions to live simply and follow moral principles delivered by ancestors and kept in documents treated with time-tested preservatives. They could play with me because my name is Kaul. And not Mr Khan. I saw the trailer to this fabulous movie, which must do good business at the box office. There was not even a hint that terror is bad and it is worse if it is perpetuated in the name of a religion that means Peace. Peace be upon all its followers and all other the creatures too. So you make a movie on the humiliation of taking off shoes to a foreign police force which has decided not to allow another 9/11. The humiliation of taking off the shoes and the urge to show that you are innocent is really too deep. But what about the humiliation of leaving your home and hearth and the world and the relatives and wife and mother and father? And being forced to live in shabby tents, at the mercy of nincompoop leaders encashing your misery and bribe-seeking babus? And seeing your daughters growing up too sudden and finding no place to hide your shame? No KJ would ever come forward to make a movie, a telling, spine-chilling narration on the celluloid, of five-year-old Seema, who saw her parents and brother being slaughtered by a butcher’s knife in Doda. Because her dad was not Mr Khan. He was one Mr Kaul. Sorry, Mr Kaul and your entire ilk. I can’t help you. It’s not fashionable to side with those who are Kauls. And Rainas. And Bhatts. Dismissively called KPs. 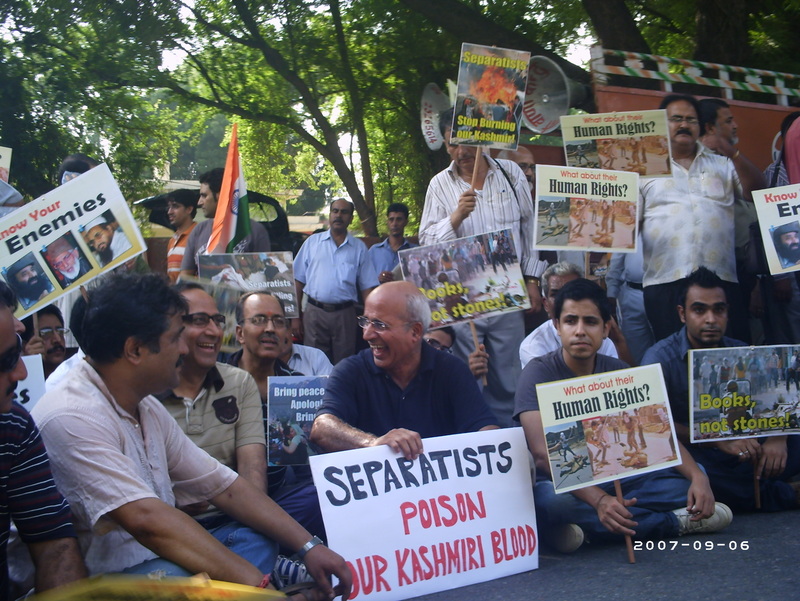 KPs means Kashmiri Pandits. They are a bunch of communalists. They were the agents of one Mr Jagmohan who planned their exodus so that Khans can be blamed falsely. In fact, a movie can be made on how these KPs conspired their own exile to give a bad name to the loving and affectionate Khan brothers of the valley. To voice the woes of Kauls is sinful. The right course to get counted in the lists of the Prime Minister’s banquets and the President’s parties is to announce from the roof top: hey, men and ladies, I am Mr Khan. The biggest apartheid the state observes is to exclude those who cry for Kauls, wear the colours of Ayodhya, love the wisdom of the civilisational heritage, dare to assert as Hindus in a land which is known as Hindustan too and struggle to live with dignity as Kauls. They are out and exiled. You can see any list of honours and invites to summits and late-evening gala parties to toast a new brand. All that the Kauls are allowed is a space at Jantar Mantar: shout, weep and go back to your tents after a tiring demonstration. Mr Kaul, you have got a wrong name. A dozen KJs would fly to take you atop the glory – posts and gardens of sympathies if you accept to wear a Khan name and love a Sunita, Pranita, Komal or a Kamini. Well, here you have a sweetheart in Mandira. That goes well with the story. And you pegged the movie plot on autism. I wept. It was too much. I wept as a father of a son who needed a story as an Indian. Who cares for his autistic son, his relationship with the western world, his love affair with a young sweet something as a human, as someone whose heart goes beyond being a Hindu, a Muslim or a proselytizing Vatican-centric aggressive soul. Not the one who would declare in newspaper interviews: “I think I am an ambassador for Islam”. Shah Rukh is Shah Rukh, not because he is an ambassador for Islam. If that was true, he could have found a room in Deoband. Fine enough. But he became a heartthrob and a famousl star because he is a great actor. He owes everything he has to Indians and not just to Muslims. We love him not because he is some Mr Khan. We love him because he has portrayed the dreams, aspirations, pains, anguish and ups and downs of our daily life. As an Indian. As one of us. If he wants to use our goodwill and love for strengthening his image as an ambassador for Islam, will we have to think to put up an ambassador for Hindus? That, at least to me, would be unacceptable because I trust everyone: a Khan or a Kaul or a Singh or a Victor. Who represents India represents us all too, including Hindus. My best ambassadorship would be an ambassadorship for the tricolour and not for anything else because I see my Ram and Dharma in that. I don’t think even an Amitabh or a Hritik would ever think in terms Shah Rukh has chosen for himself. But shouldn’t these big, tall, successful Indians who wear Hindu names make a movie on why Kauls were ousted? Why Godhra occurred in the first place? Why nobody, yes, not a single Muslim, comes forward to take up the cause of the exiled and killed and contemptuously marginalized Kauls whereas every Muslim complainant would have essentially a Hindu advocate to take on Hindus as fiercely as he can? If you are Mr Khan and found dead on the railway tracks, the entire nation would be shaken. And he was also a Rizwan. May be just a coincidence that our Mr Khan in the movie is also a Rizwan. 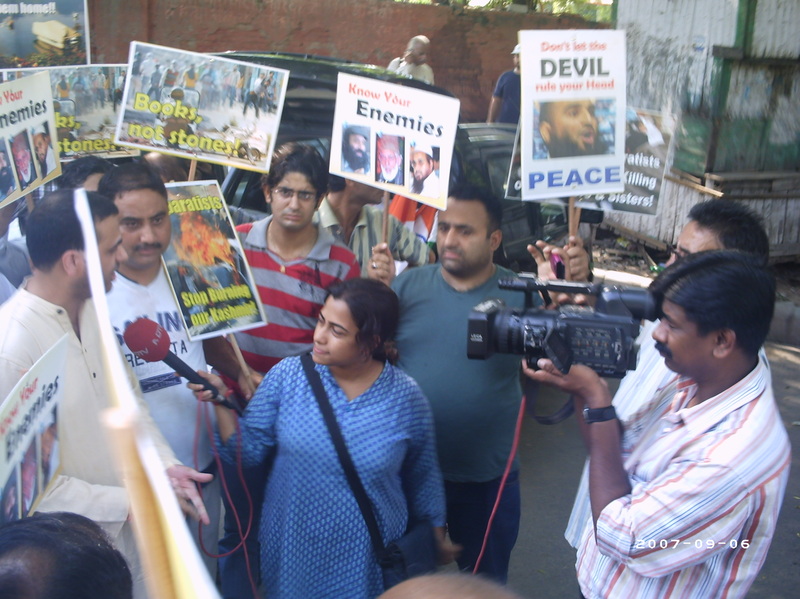 Rizwan’s death saw the police commissioner punished and cover stories written by missionary writers. But if you are a Sharma or a Kaul and happened to love an Ameena Yusuf in Srinagar, you would soon find your corpse inside the police thana and NONE, not even a small-time local paper would find it worthwhile to waste a column on you. No police constable would be asked to explain how a wrongly detained person was found dead in police custody? Because the lover found dead inside a police thana was not Mr Khan. No KJ would ever come forward to make a movie on ‘My name is Kaul. And I am terror-struck by Khans’. Give me back my identity as an Indian, Mr. Khan and I would have no problem even wearing your name and appreciating the tender love of an autistic son. The kidnap and murder of a Hindu engineer in Pakistan’s southern province of Sindh has increased the insecurity among fellow Hindus. Garish Kumar disappeared last month near Hyderabad city, 250 km (160 miles) from the port city of Karachi in Sindh. His dismembered body parts were later found near a madrassa (Islamic religious school). Police initially said the crime was committed by an outlawed Muslim militant group. Five people were arrested. However, Hyderabad’s police chief, Shaukat Shah, the incident now seems to be a simple kidnapping for ransom case. Kumar’s father, Saspal Das, is a trader from Kunri town in Sindh’s central district of Umerkot. “No one listens to the Hindu minority,” he complains. “”We have no security. Pakistan is home to some 2.5 million Hindus, 95% of them living in the southern Sindh province. Most are poor, low-caste peasants. However there are also some successful upper caste businessmen. In Sindh, they are a hot commodity for bandits. They lack the protection afforded to local tribal Muslims. Whole tribes often go to war with one another in rural Sindh over any slight to their members. That cushion is not available to the Hindu minority. In recent years kidnapping for ransom and armed robberies have multiplied in the area and Hindus have increasingly been the focus of attacks. Many pay protection money regularly to local gangs or influential figures. But in spite of this they are still targeted. Santosh Kumar, a rice trader from Larkana town in upper Sindh, and his two brothers were kidnapped in separate incidents in 2006. They were later released after paying a huge ransom. Another wealthy trader from the nearby city of Sukkur in Sindh, Sundeep Kumar, was kidnapped in 2005. He was released after paying a ransom of over a million rupees ($16,000), according to local sources. The ransom can sometimes go up to five times that amount. But not all Hindus are as rich as Sundeep Kumar. Last August, a youth, Ramesh Lal, was kidnapped. His relatives could not afford the ransom, and his body was later found at a police check post. In the last three years at least five Hindu traders have been killed after being kidnapped or offering resistance. He relates how a few years back a Hindu family travelling by local bus were kidnapped by local bandits, while rest of the passengers were allowed to go. Around that time some foreigners were also kidnapped in the same area. 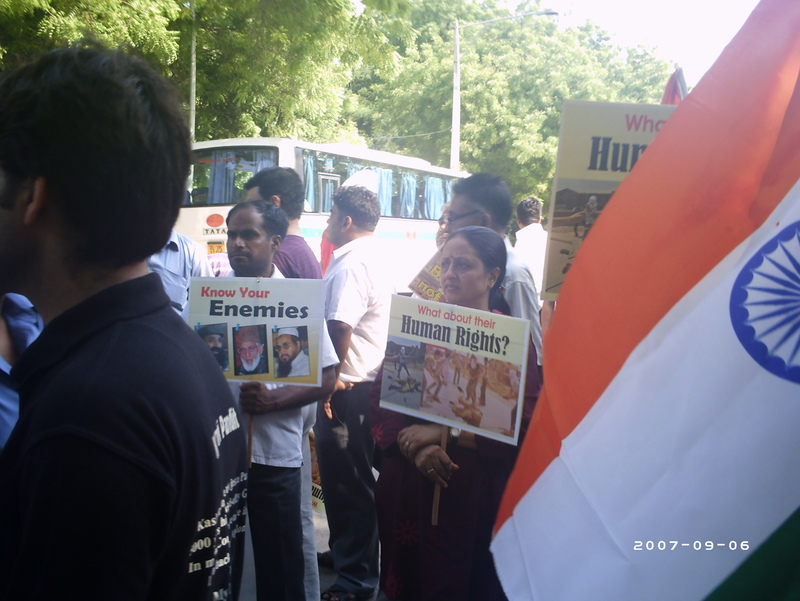 The police secured their release without any payment, but the Hindus were released after a huge ransom was doled out. Such incidents increase the feeling among Hindus that they have no say in power and authority in the country. In Pakistan’s political system, the minorities, such as Hindus, Christians and Sikhs, remain outcasts despite represented in every major political party. After Gen Pervez Musharraf seized power in 1999, he scrapped the controversial separate electorate system introduced former dictator Gen Zia-ul-Haq in 1980s. Under the separate electorate system, non-Muslims could only vote for candidates of their own religion. Seats were reserved for minorities in the national and provincial assemblies. 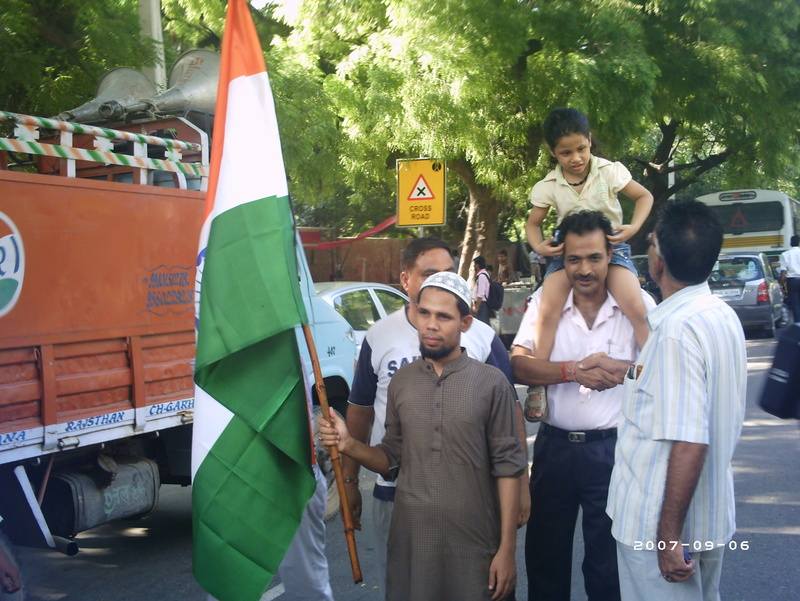 Critics said Muslim candidates no longer had any incentive to pay attention to the aspirations of the minorities. Gen Musharraf hoped to reverse that by the simple step of abolishing the system. But that appears to have failed. 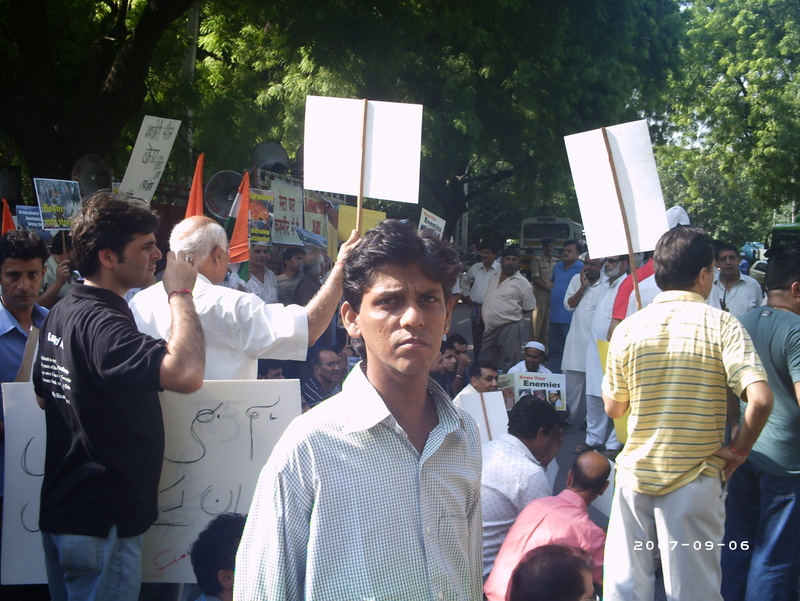 Sudham Chand, a Hindu community leader who led a local campaign to scrap the separate electorate system was killed in broad daylight. His murder conveyed many a message. The killers were not arrested. His brother later migrated to India. Ramesh Lal, a member of the National Assembly, says that the restoration of the conventional electoral system is of little use if the minorities have no security. And still, he complains, no one asks the minorities what problems they are suffering. Mukhi Aishwar Lal agrees that Hindus in Sindh are still afraid. They are frightened to move outside freely. Some even put themselves under a self-imposed curfew after 2000 hours a few months ago. “No-one is targeting the minorities,” argues Kishanchand Parwani, Advisor for Minorities’ Affairs to the Sindh Government. But he admits that, although the minorities are supposed to be equal citizens according to the constitution, the reality is different. He accepts that they feel like second class citizens. RECOMMENDATIONS OF PARLIAMENTARY STANDING SUB-COMMITTEE. 1. The Committee is moved by the pitiable condition of the migrants. Over the years the conditions have only worsened as families have grown and there has been no addition to their resources. The unhygienic environment in which migrants live is extremely deplorable. The committee is, therefore, of the strong view that the Government should give a serious thought to the problems of Kashmiri displaced person and improve their living conditions. 2. The Committee also expresses its deep concern over the pathetic condition of about 4000 Kashmiri Pandits living in the Kashmir Valley. The Committee feels that there should be special budgetary provision for Kashmiri Pandits left behind in the valley for fulfilling genuine needs of housing, employment/self employment and improving living conditions. 3. The Committee notes with concern that in the absence of adequate and comprehensive policy for rehabilitation, the Kashmiri displaced persons are reportedly being compelled to live in shanty-like camps set up in places like Udhampur, Nagrota, Jammu and Delhi. The displaced persons had left behind their properties, household goods, business establishments, agricultural land and other means of livelihood and continuing to lead their lives in scarcity and insecurity. Neither the Central Government nor the State Government has adopted a holistic approach to tackle the problems being faced by the displaced persons. The Committee, therefore, recommends that there should be clear directions by Central Government to all the State Governments and Union Territories to provide relief and rehabilitation on a uniform and holistic basis to Kashmiri Displaced Persons living in those States and UTs. The Committee also feels that all State Governments should provide land to them for construction of houses under group housing schemes and for construction of cultural centres. To the extent possible, registration charges and stamp duty should be waived as per a uniform policy throughout India. 4. The Committee is of the view that recommendations of the high powered inter-ministerial team appointed by Prime Minister, regarding medical fund, immediate employment of 1000 persons and construction of two room flats at existing places of dwelling in Jammu based camps should be implemented without further delay. 5. The Committee feels that the Displaced Persons living out side the camps need enhanced relief commensurating with the cost of living index and to countervail the burden of rent payments and therefore, desires that the Government should take appropriate steps in that direction immediately. The Committee also desires that the Government should implement the recommendations of the Sushma Chodhury Committee Report on Kashmiri Displaced Person residing outside the camps for improving their condition of living. 6. The Committee feels that the Displaced Persons should be encouraged to undertake self employment and micro and small scale industries. For this they require loans from the banks. The Committee recommends that the Government should provide the Kashmiri displaced persons the facilities of seeking soft loans from the banks to enable them to take up self-employment projects for earning their livelihood. 7. The Committee understands that the purpose of monthly allowance given to Kashmiri Displaced Persons is to ensure that difficulties and hardships faced by them are minimized and the needy families are provided with a reasonable quantum of sustenance and support. Keeping in view the requirement for a decent living and the expenditure, needed to be incurred, the Committee recommends that the Government should consider increasing the monthly sustenance allowance from Rs. I000 per month per head to a reasonable amount commensurate to the current cost of living. 8. The Committee strongly feels that the Government of Jammu and Kashmir and the Central Government should take the matter of the health care of Kashmiri Pandits with utmost seriousness and sanction them a reasonably enhanced medical allowance so that they do not die of any ailments due to lack of medical attention. It would be appreciated if the Government also make a provision for providing insurance coverage to Kashmir Displaced Persons who are leading a miserable life and many of them suffering from ailments. 9. The Committee is of the view that given the complexity of the situation, confidence-building measures among the displaced persons are necessary which needs utmost attention on the part of the Government. 10. The Committee expresses its serious concern about the criminal intent of vested interests to alter the demography in the State of J & K by not only forcibly ousting the minorities out of the State but also by changing the property rights in the revenue records, so that the migrants are left with no stake to return back to the valley. The Committee strongly feels that appropriate and effective action is required to safeguard the right to properties of the Kashmiri Pandits who have been compelled to flee the state, their homes and hearths for fear of their lives and dignity. 11. The Committee was given to understand that an Apex Committee on Relief under the Chairmanship of the Revenue Minister of the J&K, had assured that within a period of three months, all encroachments would be got vacated and the details of the Kashmiri Pandits’ properties, which had been taken over by the Divisional Commissioner of each District, would be posted on the Internet. However, no action appears to have been taken on this front. The Committee, therefore, strongly recommends that the authorities should act forthwith with all seriousness, to remove the encroachments and instill the much needed confidence in the migrants by undertaking suitable action in this regard in a time bound manner. 12. The Committee recommends that all houses of Kashmiri Pandits lying in dilapidated condition should be rebuilt by Government or a liberal grant be offered to owners of the properties to rebuild them. 13. The Committee is also of the opinion that he Government should explore the possibility of declaring all the properties, movable and immovable, sold by the displaced persons after 1989-90, as “Distress Sales” and declare the sales as null and void and accordingly restore possession of the properties back to the respective Kashmiri Pandits who were the recorded owners through the custodian of properties duly constituted. 14. The Committee strongly feels that there should be a blanket ban on the acquisition of the properties of Kashmiri Pandits by the State Government. The Jammu & Kashmir Migrant Immovable Property (Preservation, Protection and Restraint on Distressed Sales) Act, 1997 should be implemented in letter and spirit. 15. The Committee is of the considered view that the word ‘migrant’ used in the context of the Kashmiri Displaced Persons is not an appropriate expression because the affected persons had been forced to give up their homes and hearths against their own will due to the mayhem caused by the militants. The Committee is also of the view that those persons cannot wait endlessly for normalcy to return to the valley and there is no harm if some such people refer to settle outside the valley for the sake of their lives and livelihood. The Committee therefore desires that the Government should consider this aspect and announce suitable and appropriate policy measures. 16. With the displacement of Kashmiri Pandits from the Valley, they not only lost their homes but also means of livelihood which aggravated their agonies and miseries. The Committee, therefore, recommends the Ministry of Home Affairs to explore all avenues for providing employment to them under the package announced by Prime Minister in 2004 with a time -bound programme. 17. The Committee was given to understand hat the direction of the High Court of Jammu and Kashmir to provide relief to the Jammu Migrants at par with the Kashmiri Migrants has not been implemented either by the Central or State Governments. The Committee also notes the order dated July 12, 2006 of the Supreme Court that the Relief Commissioner may ensure whether Jammu Migrants were provided with all relief measures to which hey were entitled as per the policy and any arrears to be paid to the migrants should be made available to them at the earliest. The Committee expresses its anguish that no step have been taken to provide relief to the Jammu Migrants. The Committee recommends that immediate steps may be taken to implement the directions of the Supreme Court. 18. The services of Kashmiri Displaced Persons who have been appointed as Teachers on ad hoc basis in MCD and Government of NCT of Delhi Schools, should be regularized. The Committee was given to understand that there are cases where Kashmiri teachers have been working on contract for the last thirteen years. The Committee is of the view that all such cases should also be regularized as soon as possible. 19. The Committee recommends to the Government to examine the demand made by the Kashmiri Displaced Persons for providing constitutionally guaranteed schemes for their social, political and economic upliftment and come out with appropriate measures. 20. The Committee takes a serious note of the fact that the actual expenditure on account of implementation of rehabilitation programmes for J&K displaced persons during 2006-07 was only Rs 69.31 crore as against the allocation of Rs. 120 crore and against Rs. 120 crore kept for 2007-08 in BE, only Rs. 100 crore was provided at RE 2007-08. The Committee once again took serious note that as enough claims were not received from the Government of Jammu & Kashmir, only Rs. 110.00 crore was kept in the BE 2008-09. The Committee in its successive Reports, i.e. 119th, 126th and 130th Reports, urged upon the Ministry to impress upon the J&K Government about the necessity of sending schemes expeditiously and implement them in time so that all the J&K Displaced Persons are rehabilitated without further delay. Inspite of those recommendations, it is unfortunate that the Government of J & K has not taken requisite action. At the same time, the role and responsibility of the Ministry of Horne Affairs do not end by merely requesting and advising the State Government. It has to play a proactive role in the matter and vigorously pursue with the Government of J&K at the highest level so as to convince the latter the need for formulating rehabilitation schemes and sending them on time to the Central Government for further action. The Asian Human Rights Commission has received information from Pakistan that the government of the North Western Frontier Province has banned the booklet on Kashmir titled “Kashmir Ki Pukar” (loud voice of Kashmir) on October 21 by issuing an official notification. The writer was informed through telephone calls that if he enters the province he will face dire consequences, including loss of his life. The writer is receiving threatening calls at his home and to his mobile phone insisting that he denounce the book and make an apology in public, otherwise his family will not be safe. The writer says that most of the calls are from the officials of Pakistan secret services (ISI). When the writer made a phone call to the number from which he was receiving the threats no one answers the call. Even if it was answered by chance, there is just an announcement telling that this number is not in use. The police have not yet registered the author’s complaint of being threaten yet. Mr. Arif Malik is a prominent journalist from Mirpur, the capital city of the Pakistan territory of Kashmir and has worked in several leading newspaper companies in different cities of the country. He is the editor of monthly magazine “Bharosa” in Mirpur, which was closed down after the ban on his booklet was announced by the government. The book “Kashmir Ki Pukar” (the loud voice of Kashmir) was largely circulated in Pakistan and it has given a different view about Kashmir’s stand with the Pakistani government and holy war in Kashmir on the both sides of India and Pakistan. The writer criticised the Muslim religious Parties and their leaders about their role in holy wars in the book. Mr. Malik accused the government of Pakistan that it had treated Pakistani side of Kashmir as its colony, not as an independent state and claimed that Pakistani Kashmir is run by the ministry of interior of Pakistan. Although Pakistan Kashmir has a parliament, the elected members all have close connections to the government of Pakistan and the military intelligence service including the ISI. He also pointed out the role of the ISI in the holy war against India by referring to several examples from the past. 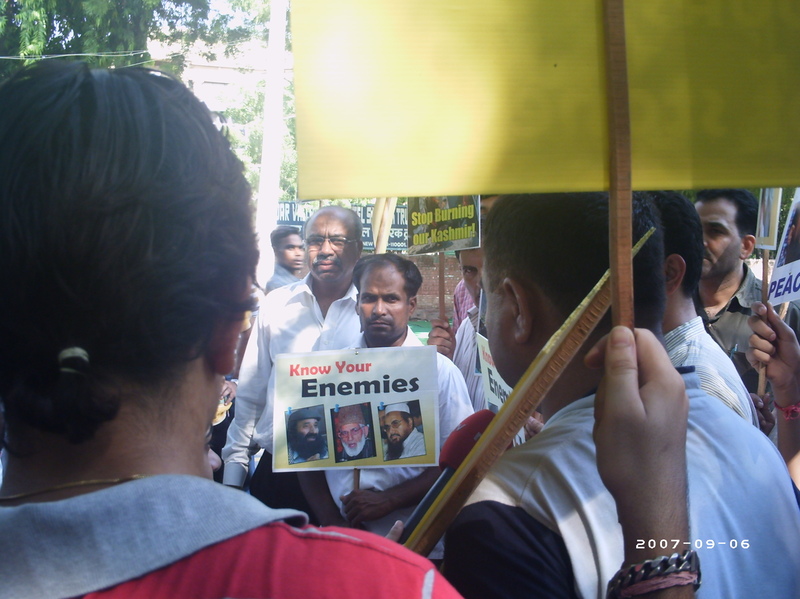 The audacious greediness of religious fundamentalist parties and its leadership was also criticised by him in the book and he pointed out the privileges that those people had been enjoying over the propaganda that they made during the war, urging youths in the country to sacrifice their lives for the holy war. In the book he also pointed out a cynicism towards the two-faced attitudes of the religious parties that once fought against Pakistan government for the rights of people in the Kashmir territory and called the youth to sacrifice their life for the so called “holy war” against the imperialism of the United States. The religious parties now are catering to the extremist Pakistani government. The writer, Mr. Arif Malik is now facing threats to his life since his book was published. He tried to register the report to the police however the Mirpur police station refused to register the case. Instead the police officials said this is a high profile matter so that only high officials in the rank of Superintendent Police can register this type of case. The writer is receiving continuous threats, not only from fundamentalists groups but also from the army, particularly from the ISI. Mr. Malik and his family cannot move about freely after they started to receive threats and now they are taking shelter in different places. The government of NWFP instructed the police in the province to arrest the writer when they find him in the province. The government of North Western Frontier Province (NWFP) is purely Islamic fundamentalist and the members are from Islamic religious groups who had started a holy war after the intervention of USSR in Afghanistan in 1980. The fundamentalist religious parties have won the elections in NWFP in 2002 as an alliance group called Muttehda Majlis-e-Amal (MMA). This alliance has also won several seats in different assemblies including National Assembly. In 2002 MMA formed a government in NWFP and announced the Islamic system by introducing the Hisba bill (accountability bill) that allows district Islamic officers to monitor the religious conviction and practice of Islam of all citizens. Please write letters to the concerned authorities and urge them to provide protection for the life of Mr. Arif Malik and his family and take necessary actions to stop the intimidation and take legal action against the perpetrators. Please also demand the governments of NWFP and Pakistan to respect the freedom of speech and movement within the country as it has been guaranteed in constitution of Pakistan that meets the international human rights standards.